It’s a warm afternoon in Kabul in June, and a group of Afghans, young and old, men, women and children, have congregated in the grounds close to one of the city’s largest mosques. The crowd has convened to hear a caravan of peace activists, who travelled 700 km by foot, demanding a peaceful end to the decades-old Afghan conflict that has claimed countless lives. Among those gathered was an eight-year-old Afghan kid who had accompanied his father to hear the peace activists talk about their journey. He listened to them with rapt attention and took selfies with some of them using his father’s phone. “I wanted him experience this. I am raising him to be prepared to live in this country,” the young boy’s father, 38-year-old Attaullah Khan, told this writer. Even at that tender age, Mr. Khan said, his son was acutely aware of the conflict that engulfed the nation, increasing steadily by the day. “He has already seen so much death and destruction that now he associates the concept of dying with the Taliban. When a dog died on our street recently, he thought it was killed by the Taliban,” Mr. Khan said. Meanwhile, another man, also part of the peace caravan, shouted out on the speakers. “This is not our war; we don’t want this war.” Others cheered along with chants of ‘Allahu Akbar’ (God is great). The group of peace-marchers started its journey from the war-torn province of Helmand following a series of attacks. 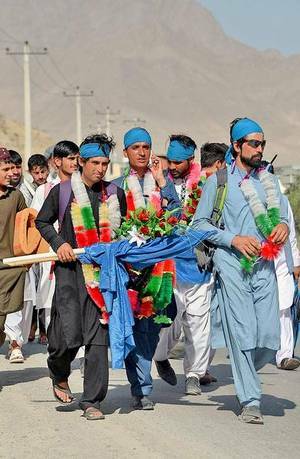 They walked on foot across seven provinces of Afghanistan, making the 700 km journey in a little over 40 days, spreading their message of peace among locals. Their four-point demand lays emphasis on the need for an indefinite ceasefire, peace talks between warring parties and setting a timeline for the withdrawal of international forces from Afghanistan.